When is the last time you stripped the tile floors in your home and had them refinished? If it’s been awhile now, they probably don’t look as bright and shiny as they once did due to the wax buildup on them. To fix this, you will need to strip them by removing all of the wax on the top layer of them and then refinish them to get them glowing again. Here are some tips that will help you strip your floors successfully. Stripping a floor is one of the most painstaking projects you will ever do. You should know going in that it can take hours to strip a floor and prepare it to be refinished. With that in mind, it’s absolutely essential for you to utilize the right tools and equipment. Tile strippers, for example, should be used when stripping tile floors. If you try to strip the floors without using a stripper, you won’t get very good results, and worse, it will likely take you days and even weeks to strip your floors down. Rather than trying to tackle your whole floor at once, you should divide your floor up into sections and focus on finishing each section before moving on to the next one. Outside of helping you keep your sanity, this will also ensure you use the proper technique when stripping your floor and prevent you from missing any spots. One of the worst things you can do when stripping a floor is rush through the process. While you might be inclined to try and fly through the job, it will result in you not stripping the floors properly. It’s essential for you to take your time. It’s also essential for you to rinse your floors when you are done to make sure they’re completely clean. When you apply your finish later, it will show if you didn’t do a good job cleaning your floors. 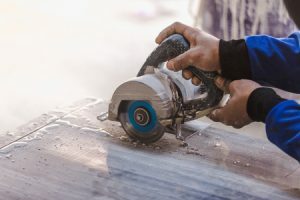 For those interested in stripping their floors on their own, Lawrence Tool Rental can provide you with the tile saws and tile strippers you will need to get through it. Call us at 317-826-2654 today to arrange to rent this equipment for your next floor stripping project.